I may have mentioned that I really like the new Hobbit movie (I just went and saw it again last night). 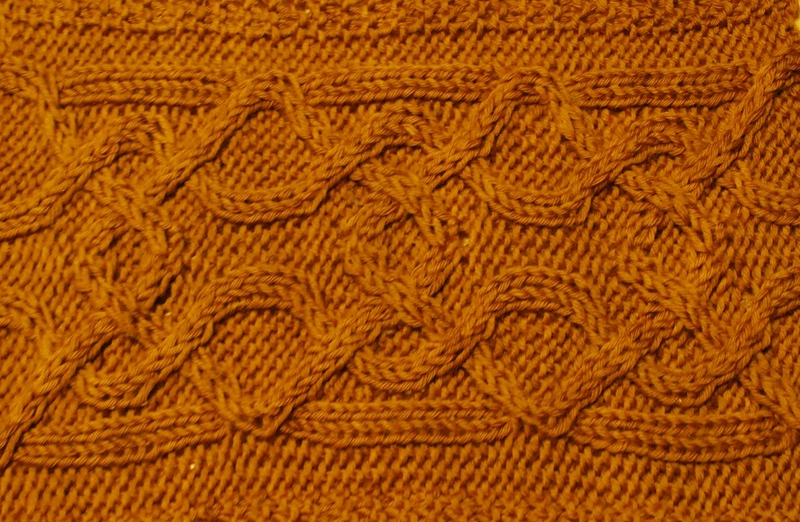 Anyway, when I saw the celtic knotwork pattern that adores some of Kili's costume (and, as I have found out in the meantime, also can be found on Fili's coat), I though that this could be made into a knitting pattern. 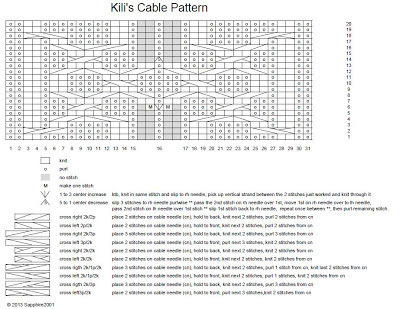 Or at least I should be able to work out if this can be tranformed into a cable pattern. 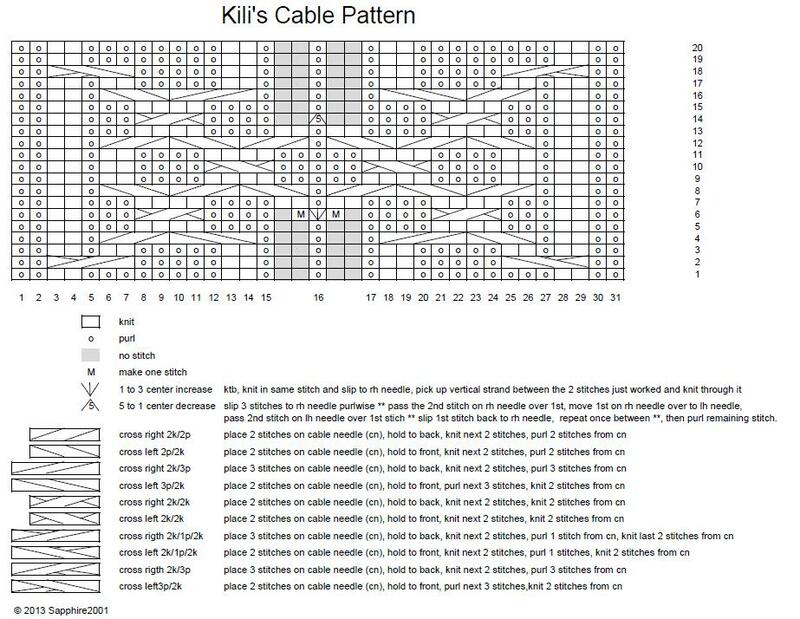 The swatch is three repeats of the chart. 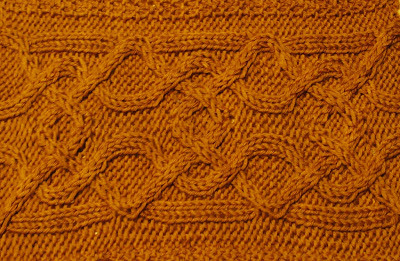 Sadely this is a bit wide to use in a sock (which was my first thought), but it should work fine on the back of a fingerless glove or simply as a band in a sweater or cardigan. Or, maybe as a trim on a hood/scarf combination. So﻿, what are you going to do if you don't want to waste precious pieces of fabric on something you won't be able to use in the end: You (or in this case, I) make placemats. This also had the added bonus that I didn't just train doing FFQ, I also had a chance to try out two other techniques. 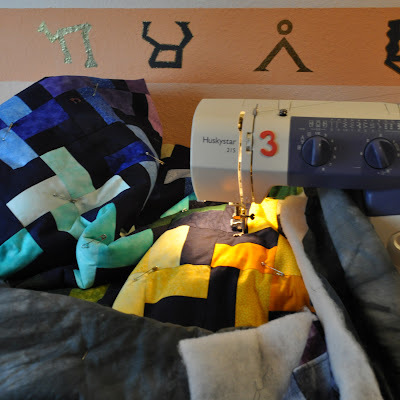 The first one, in the picture on the left and the right side is using 'Quilters Grid', which is a kind of fusible quilting aid with a 1" grid printed on on. 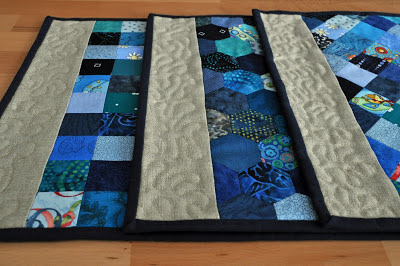 Using lots and lots of little 2" squares, you lay them out, fuse them to the quilters grid with you iron and then can sew them easily together without them shifting of flying around. 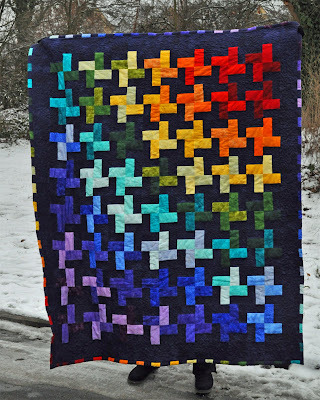 Second technique to try is some paper piecing using 1.5" hexagons printed on and then cut out of freezer paper. 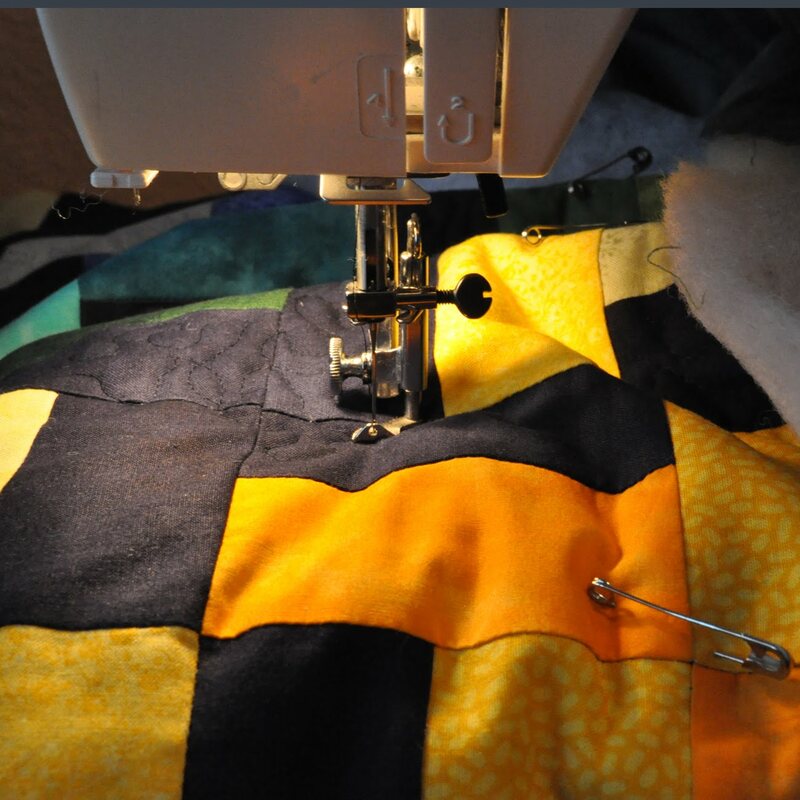 The little hexagons of paper are then ironed on to little pieces of fabric and everything is sewn together by hand. For the FFQ I drew lines on the farbic using a marking pen that disappears once you iron over it. 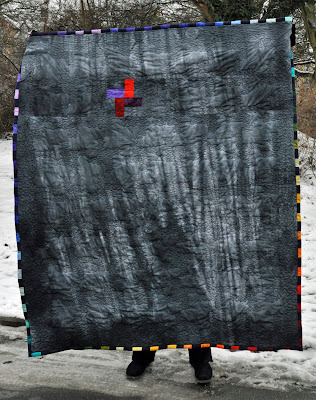 After those three placemats I felt comfortable enough to not mark the quilt beforehand. 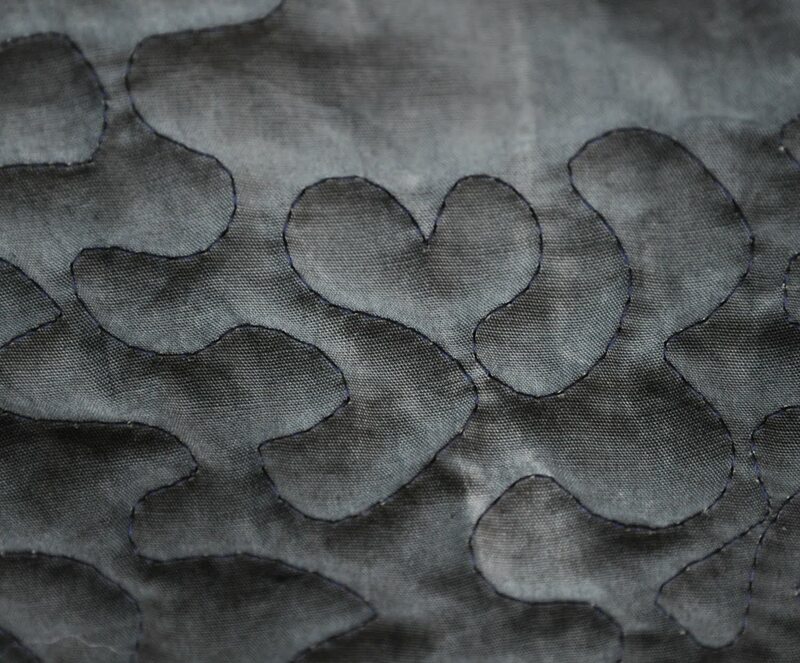 The free form quilting worked quite well, and eventually I got bold enough﻿ to add some more distinct forms. 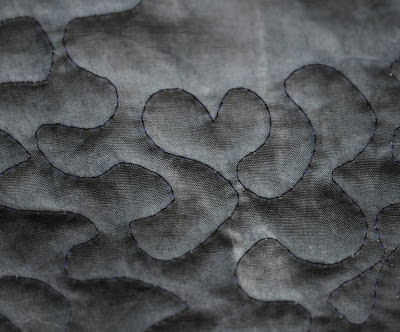 It's actually fun to look at the quilt and start searching for those little hearts. The grey of the backside is in reality a mix between the picture above and the one below. Grey with a touch of blue and a breath of green. If asked what I like most about the quilt I probably would say the edging. Even though I ignored all the usual rules for making a binding, it worked out exactly as I hoped. 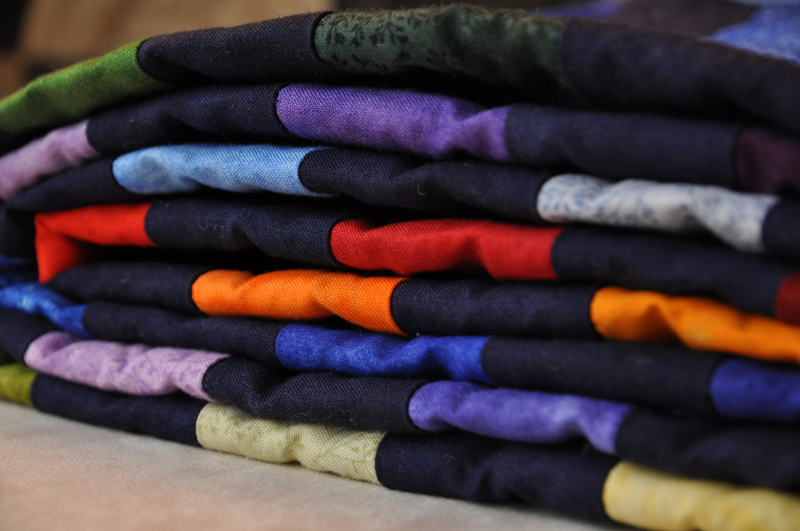 All I need now is to grap a friend, a camera and possible some sunshine to make a proper photoshoot outside. 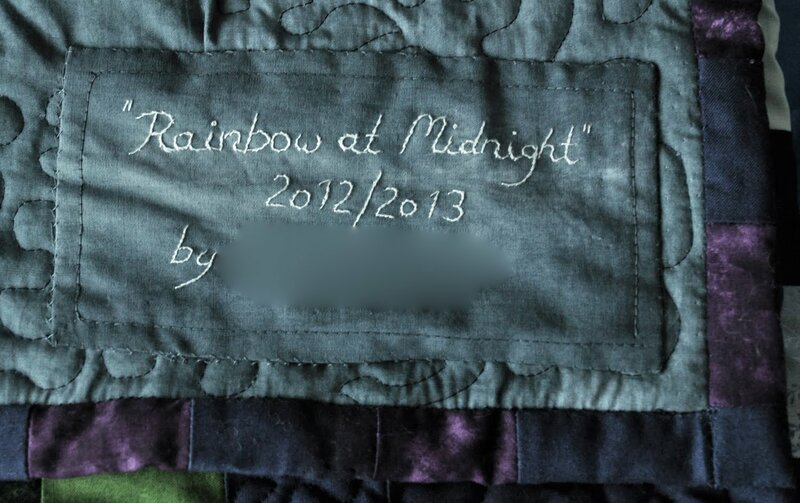 Progress on my Rainbow quilt. 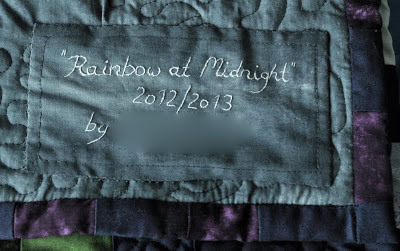 I'm only quilting the dark blue parts, leaving the rainbow colored bits untouched. The freeform quilting is working okay, the toughest part is actually handling a 1,80 x 1,60 m piece of fabric sandwich around and through the machine. 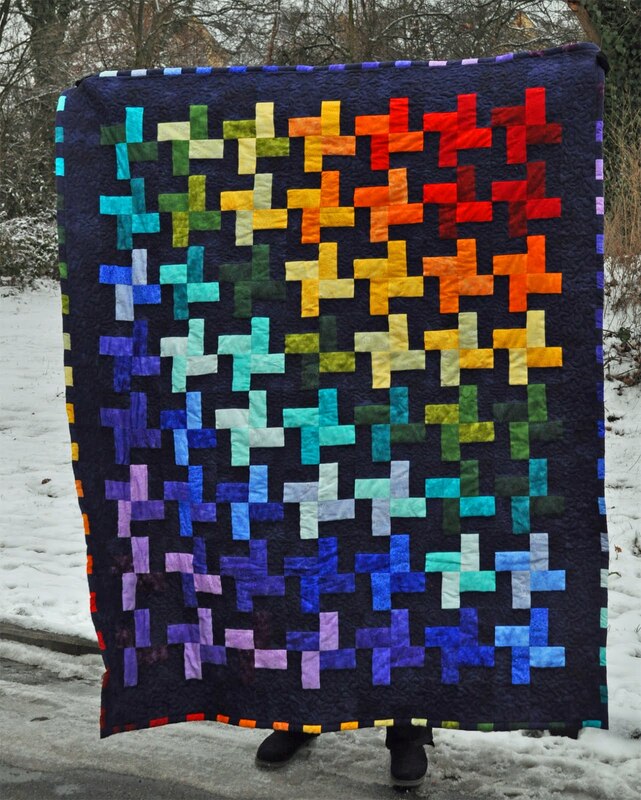 I'm now pretty much at the center of the quilt and for some reasons the thread is breaking every so often. Very annoying this.